TORONTO, ON – It’s been in the works for months, and aside from a brief mention on Facebook last week, it’s been kept well under wraps. But now, Canadian Beer News is able to fully report on the Mill Street Airport Pub set to open later this month at Toronto Pearson International Airport. In an exclusive interview with CBN, Mill Street Brewery co-founder Steve Abrams revealed many details about the new establishment, which was inspired by the brewpubs and brewery-affiliated bars found in many American airports such as the Rogue Ales bar at Portland International Airport and the Goose Island Pub at O’Hare Airport in Chicago. First and foremost, Abrams noted that the brewery has no financial interest in the venture, but has licensed the use of the Mill Street name to SSP Canada, the Canadian division of an international company specializing in high quality food and beverage service at travel hubs around the world. Providing a close connection to Mill Street, however, is the involvement of F.A.B. 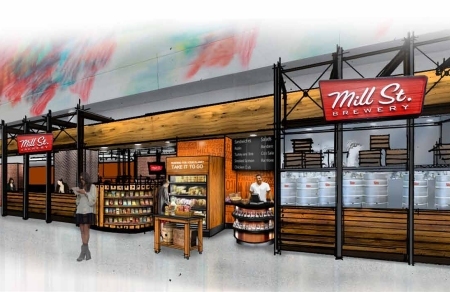 Concepts, the brewery’s partner in both the Toronto and Ottawa locations of the Mill Street Brew Pub, which will be managing the Airport Pub to ensure the branding and quality are consistent. While no brewing will take place on-site, there will be 10 Mill Street beers on tap along with their root beer, plus several non-Mill Street brands. The beer will be served from a unique ceiling-mounted draught tower that was custom made by Lancer Beer Systems, and the bar will also feature a glass-encased area with Mill Street kegs on display. In addition to regular bar service, there will be beer sampling and other events on a regular basis. At 3400 sq. ft. in size, the restaurant will seat approximately 105 people, along with another 25 at the bar. The food menu will be smaller than the ones offered at the full-sized Brew Pubs, but will still focus on casual pub favourites – burgers, fish & chips, steak, meat pies – at prices comparable to the Distillery District location. 11 TVs will show local and international news and sports programming, and there will also be a separate take-out area with sandwiches, soft drinks and other grab’n’go items for travellers in a hurry. Mill Street Airport Pub will be located between Gates 120 and 122 in Terminal 1 at Toronto Pearson, and is scheduled to open on Monday March 26th. That’s a disappointment….I was hoping Terminal 3. Tired of the really fine choices, such as Coors Light and Molson stuff.